Upgrade is the second film by the Australian Leigh Whaddel, a co-creator of the Saw franchise. Thankfully this film represents a movement away from Whaddel’s earlier gory shenanigans and is a venture into the holiest of holies: science fiction. 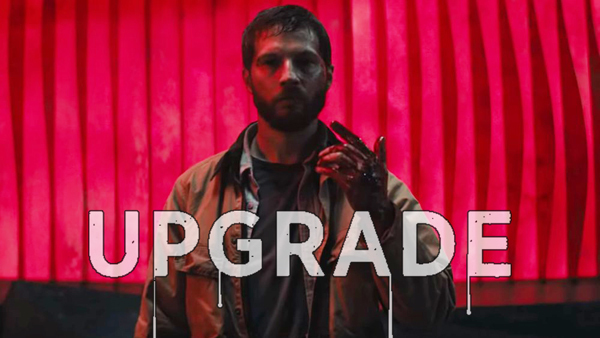 As opposed to exploring a world where a pig mask wearing grandpa gets hard from forcing strangers into violent existential crises, Upgrade is a change of pace from Whaddel’s horror roots with something far more relevant to our current times: gritty, AI-centric cyberpunk. In essence it’s a bloody revenge film revolving around stay-at-home mechanic Grey Trace (Logan Marshall-Green). During an ambush by cybergangsters, Grey’s wife is killed before him and, after being shot and stunned multiple times, he is rendered quadriplegic. Merely ending things there would be committing cinematic suicide, so Grey is given the opportunity for a new beginning with the help of “Stem,” an AI chip that, when inserted into his spine, asserts control over his limbs and allows him to move once more, with deadly precision to boot. What could possibly go wrong? Upgrade’s biggest seller is its depiction of a believable, future landscape not too far off from our own present. Featuring self-driving cars and weapons implanted into bodies, it creates a portrait of a world that we could easily find ourselves confronted with in another one or two decades. Whaddel’s first sci-fi attempt has produced a much more interesting film than his previous Saw and Insidious work, and I hope he continues in this vein. If you’re an AI doomsday theorist you’re probably going to enjoy this one. In its adrenaline-fueled climax and finale, Siri’s evil twin leads Grey into some pretty sadistic actions. There’s a lot of First Law breaking here, and Isaac Asimov would not be happy.